We expect much from our electronics these days. Our phones need to surf the Web. We want our snapshot cameras to record movies. So a printer that just spits out ink-covered pages seems so, well, yesterday. Nearly every major printer manufacturer has released a hybrid device that saves us time and space while increasing productivity. The Photosmart C6380 is an HP entry into the “do everything for you” derby, and it’s worth a closer look for the photo enthusiast with a home office. The C6380 prints documents up to 8.5 by 11 inches from the 125 sheet paper tray, and includes a dedicated 20-sheet photo tray for 4-by-6 and 5-by-7 prints. It has a 4,000 dpi, 48-bit color flatbed scanner that serves double duty as a copier, a 2.4-inch color LCD to preview images and operate menus, a memory card reader (SD, CF, xD, and MS), and a front USB port that accepts flash drives so you can scan and write directly to removable media. This unit does not have fax. The first thing you’ll notice when you unpack the box is how compact and light the C6380 is. It weighs a svelte 11 pounds with a footprint about the size of a standard dinner placemat. Its built-in Wi-Fi is Mac friendly; plug it in, press the Setup button on the front panel, choose Network from the popup LCD screen, follow the steps in the Wireless Setup Wizard, and the C6380 is a member of your network in a matter of minutes. If you’re not running wireless, then you also have USB and Ethernet connectivity available, but you’ll have to provide your own cables. Once you establish connectivity, then it’s time to insert the included support CD into your Mac to upload the drivers and software. You’ll need Mac OS X 10.4 or later. I recommend that you install the entire package because the HP Photosmart Studio application has some useful features including a photo browser, slideshow player, panorama stitcher, and more. Printing to the Photosmart C6380 using iPhoto. Don’t keep this device in the bedroom because it does like to rumble and grind before and after print jobs. You might accidentally wake the baby when generating snapshots for grandma. What’s interesting about the C6380 is that you can accomplish a lot with it without ever connecting the computer. If you need a straight photocopy up to A4 size, just put the original face down on the scanner glass, close the lid, and press either the Black or Color Start Copy button. According to my stopwatch, letter-sized monochrome copies were competed in 21 seconds. Full color copies took 35 seconds to emerge. On regular 24-pound, 98 bright ink-jet paper, the black output was outstanding. The color output was good, but wasn’t as vibrant as the originals, mostly noticeable as less saturated in the darker tones. I would judge the plain paper color copies acceptable for everyday office use, but not for critical work. The bar was raised, however, for photo print duplication on to HP Advanced Photo paper. I tested this function by using a Costco lab print, placing it face down on the scanner glass, and choosing Scan and Reprint fro the Scan menu on the LCD screen. (Other options in this menu include scan to computer, to memory card, or to USB Flash drive.) This time the C6380 automatically selected the photo tray and output a near perfect copy of the print in one minute, 13 seconds. Color reproduction was outstanding. My only nit was that the duplicated photo was slightly magnified and cropped compared to the original. You’d have to hold them side by side to see the difference, but doing so, you’d notice. I decided to see how well the C6380 could reproduce the full 8.5-by-11 enlargement if I put HP Advanced Photo paper in the bottom letter tray. This time I selected Reprints from the LCD menu, hit the Options button to select 8.5” x 11” output, and hit the Print button. In two minutes, 57 seconds, the duplicated image emerged. The tone and color fidelity was outstanding. But I noticed that the image was positioned on the paper differently than the original which had 1/4-inch borders. So I tried again, this time using the Crop command that allowed me to reposition a 100 percent view of the original on the paper. The second output was positioned on the paper better than the first, but still not identical to the original. In this scenario of duplicating a print with borders, I recommend that you make the output borderless and magnify the image a bit. You will lose some information on the edges, but the output looks cleaner. You can also insert a memory card into the appropriate slot in the front of the unit, mark the images you want to output via the LCD screen, and generate lab quality prints in less than a minute each. Keep in mind that the images need to be in the JPEG format on the card. If you shoot using the raw file format, and want to take advantage of this convenience, then record in raw+JPEG format. The HP will only acknowledge the JPEGs on the card. 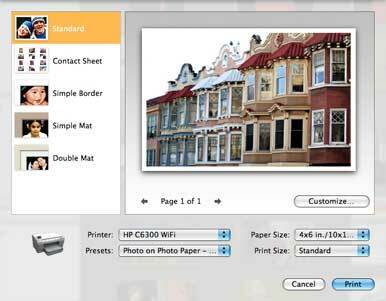 Another tip, regardless if you’re printing from your Mac or directly from other media, is to use HP Advanced Photo paper for the output. This isn’t a recommendation to line the pockets of the manufacturer. If you look on the back side of the HP paper, you’ll see the HP logo and a set of bar codes. These codes are read by the sensors in the C6380 to tell the printer important information about the paper so it can optimize the output. This approach works so well that you don’t need to fool with ICC profiles for your photo output. 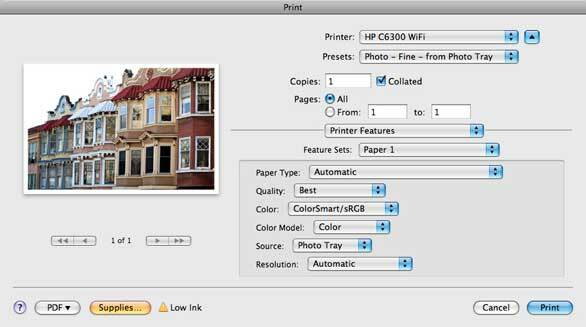 In the print dialog box, let the printer handle color management and that’s it. In my tests with a calibrated monitor (using a Spyder 2), tone and color were managed very well on HP Advanced Photo paper. Another bonus of this system is that it prevents you from printing on the wrong side of the paper. As well as this works, it doesn’t mean that you can’t print on other paper stocks. The C6380 will also scan the surface of third party papers and do its best to optimize the output based on that reading. All of this makes printing from iPhoto a snap. Go to File->Print, select the printer and paper size, and hit the Print button. In the next screen, choose Color Matching from the popup menu in the the middle of the dialog box, and make sure that Vendor Matching is selected. Then hit the Print button again. in less than a minute and a half, you’ll have a 4-by-6 print that should look very similar to the image you see on your calibrated Mac monitor. The output on HP paper is rated for 60-plus years fade resistance and 15-plus years ozone exposure. You can run water over the prints, dunk them, and the ink won’t smear. For all practical purposes, they look and feel like prints from a photo lab. If you stick with standard black ink for your document copies and 4-by-6 prints for photo output, the C6380 is fairly economical to maintain. But once you start making color copies on a regular basis, or big photo enlargements, then you better have a stash of ink on hand, because you’ll find those cartridges going dry pretty fast. As a bonus, the C6380 has the child-friendly templates built-into the device; you can even print out lined paper in a pinch. card slots, 2.4-inch LCD preview display. The Photosmart C6380 printer is best designed for the photo enthusiast who also needs occasional plain paper output and document copying. However, this isn’t the best choice for a business setting where photography isn’t as important as printing speed and high volume document handling. Plus the cost to maintain would be too high for everyday office needs. 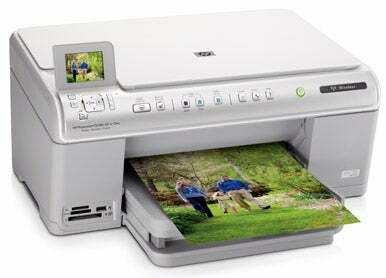 For the family photographer, then the HP Photosmart C6380 could be a great solution.